1. Soak raisins in bourbon. Microwave for 1 minute and let sit until ready to use. 3. While dough is chilling, peel and slice apples. Toss well with all remaining apple filling ingredients. Drain raisins and add to apples, mixing well. Chill. 4. In the meantime, bring sugar and water to a boil until golden Amber in color, shaking pan occasionally but not stirring. Turn off heat, adding butter, whisking until smooth. Add cream, vanilla, bourbon, and salt. Whisk well. Chill until cool. 5. Preheat oven to 425 degrees F Place rack in bottom third of oven. 6. Roll out one disc of pastry. Fit into the bottom of a standard pie tin with a removable bottom. Trim edges to fit. Return to freezer. Save trimmed edges. Re roll and cut small leaves with small paring knife for the edge of the pie crust. Need about 30-40 leaves. 7. Roll out other disc of dough. Using a pastry wheel, cut long thin strips for the lattice. 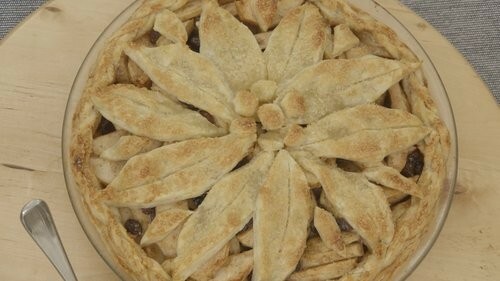 Save any trim and make additional leaves or a pastry apple for the center of pie. Remove pie tin from freezer, fill with apple mixture. Pour about half of caramel mixture on top. Weave lattice on top of pie. Add leaves to edge of crust all the way around, adhering with a bit of water if needed. Mix egg yolk and cream, brushing on pastry lightly with a small pastry brush. Sprinkle evenly with sugar. 8. Bake for 45-48 minutes. Cover with foil when top starts browning. bake until golden all around and filling bubbles. 10. Whip cream to stiff peaks, adding a bit of the reserved caramel sauce for serving alongside pie if desired.